“I’d be happy to help you.” I put down my pen and opened the store calendar on the computer. Most of the best dates over the summer and into the fall were already booked. “Can you tell me something about yourself and your book?” As the name of my shop suggests, we focus on Sherlock Holmes and Sir Arthur Conan Doyle, but I try to support local writers whenever I can, regardless of what they’ve written. “Let’s start with the title of your boss’s book, shall we?” While my attention was distracted, Moriarty the shop cat settled himself in the center of the publisher’s catalog I’d been browsing. I wiggled the edges of the paper. He hissed at me. I poked his side with a pencil. He hissed louder. Desperate measures were called for. I feigned as if turning back to the computer and then swept in, picked him up, and put him on the floor. He managed to give my arm a light scratch. Moriarty lived on the premises. Small and thin and pure black, he was a great shop cat. Everyone loved him. He could be counted on to be charming and friendly to shoppers and to treat their children according to their age. He seemed to be able to tell which people didn’t care for cats, and in those cases, he respectfully kept his distance. Everyone loves Moriarty. Except me. That is because Moriarty loves everyone. Except me. This time he hadn’t drawn blood. I consider that a victory. He held his tail high and stalked across the room and out the door without as much as a backward glance of apology. “Sorry,” I said. I’ve found most writers to be extremely pleasant, lovely people, more than happy to do whatever they can to accommodate my bookshop and schedule. The odd one, however, seemed to think he or she was doing me an enormous favor by bothering to stop in and grace my bookshop with their presence. “No, you didn’t. I’m Gemma Doyle. I’m the owner and manager of the store.” I am also the chief duster, the head bookkeeper, the buyer, the returner of unsold stock, the human resource manager (of the single employee), the cat feeder and litter box cleaner, and the head sales clerk. I didn’t bother to tell my caller all of that. The poor woman sounded like a bundle of nerves. I wondered if she was always so nervous or if her boss was standing over her, impatiently tapping a ruler into the palm of her hand. I took a deep breath. Wow. Two years ago, when the first book in the Hudson and Holmes series, An Elementary Affair, began to generate notice (and huge sales), I tried to invite Renalta Van Markoff to the bookshop. I never managed to get past personal assistants, publicists, and other interfering busybodies. I’d been led to believe that my tiny shop wasn’t big enough, important enough, to host Miss Van Markoff. Maybe none of her staff had bothered to ask the author what she thought of that. “Of course,” I said. Meaning no, but I could try to find one. I stared at the phone for about two seconds. Then I leapt to my feet. I bolted out of the office and dashed down the stairs. I made it about halfway before turning around and running back up to open one of the boxes and grab a handful of books. They were weighty tomes. I hadn’t even glanced inside one yet, but I estimated it to have 736 pages. Back downstairs with my arms loaded with books, Moriarty tried to trip me on the bottom step, but I was ready for him, and I deftly dodged his outstretched paw. “What’s got you in such a tizz?” Ashleigh, my new assistant clerk, asked. I dropped the books on the counter. “I want a big display of these. Along with the earlier ones in the series.” Like most mystery novels, when a new book was released, the sales of the earlier in the series went up substantially. “We already have a big display of those.” Ashleigh gestured to the center table, piled high with hardcover copies of Hudson House. The cover showed a street of three-story white row houses with black doors, pillared entranceways, and second-floor balconies with black iron railings. A woman, dressed in a brown-and-gold silk gown with a spray of feathers in her dark hair, was coming out of a house with “221” prominently displayed on one of the pillars. The street might have been one that I’d lived on in London, but if so, it was of another time. A hansom cab could be seen disappearing into the mist. It was night, and thick fog swirled around gas lamps. “We need more,” I said. “Why?” Ashleigh asked. She’d only been working here for a short time, and she was proving to be hardworking and reliable. She had a tendency to question everything I did. This can be good in an employee—keeps me on my toes. It can also be bad—I am the boss, after all. “Which we are,” Ashleigh said. “Even harder, then,” I said. “Just a guess.” I busied myself arranging the volumes. The covers of Renalta’s three books all showed the same street. A woman coming out of (or going into) number 221. Only the time of day, the weather, and the woman’s attire differed. “That was quite the guess,” Ashleigh asked once Ellen, giving me more suspicious glances, had left. “And proud of it,” she replied. “If you like that series, you might also like…” Ashleigh discreetly led the women to the gaslight fiction shelf. I picked up a copy of the book and checked the last page. 720. Rats, I’d been off by sixteen pages. Along with my great uncle Arthur, I own the Sherlock Holmes Bookshop and Emporium, located at 222 Baker Street, West London, Massachusetts. 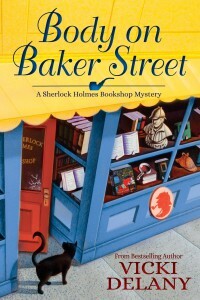 As can be assumed by the name, we stock Sherlock Holmes–related books and merchandise. Not only second and later editions (and the occasional first) of the original Sir Arthur Conan Doyle books or the magazines in which the stories appeared, but modern pastiche novels, short story collections, and anthologies. As many of those as there are (and more every day), it’s not enough to keep a bookshop fully stocked, so we also sell nonfiction relating to the life and times of Doyle and his contemporaries and historical fiction we call gaslight—books set in the mid- to late Victorian or Edwardian periods. The “Emporium” part of the shop’s name refers to all the coloring books, games, puzzles, mugs, teacups, posters, DVDs, making-of books, and so on related to Holmes and Watson. I never fail to be astonished at what some fans will consider to be treasures. “I’ll give one of those a try then,” the shopper said, and The Beekeeper’s Apprentice was added to the pile. A family browsed the children’s section, and a group of vacationing hipsters was studying the Sherlock paraphernalia, exclaiming everything to be “cool” and “ironic.” I feared that we’d soon be due for a fresh interpretation of the Great Detective with unkempt beard and man-bun. “I’m popping into the tea room,” I called to Ashleigh. She lifted one hand in reply. My shop is attached to the building next door, number 220. A year ago, we’d knocked down part of the wall, put in a sliding glass door, and opened Mrs. Hudson’s Tea Room. Uncle Arthur and I own half of that business. Jayne Wilson owns the other half and manages the tea room and serves as the head cook and baker. As well as my business partner, she’s also my best friend. “Jayne in the back?” I called to Fiona, who was ringing up a takeout coffee and bran muffin. “Where else would she be?” Fiona asked. “Good point.” I went into the kitchen. It was eleven thirty and the kitchen was a flurry of activity as Jayne and her helper, Jocelyn, did lunch and tea prep. Mrs. Hudson’s wasn’t only a tea room; Jayne serves takeout coffee and baked goods all day, lunch from eleven until two, and afternoon tea from one until closing at four. When we first began planning the tea room, I told her that one o’clock was ridiculously early for afternoon tea. She’d replied that the Orangery at Kensington Palace starts serving afternoon tea at noon. So there. I gave in, realizing that in the face of the modern tourist industry, some standards have to give. “Busy?” I asked. The question was redundant, seeing as giant pots of soup simmered on the stove; Jocelyn was up to her elbows in sliced tomatoes, onions, and peppers for lunch sandwiches; a tray of raspberry muffins waited to be taken out front; and Jayne’s face was dotted with flour, her white apron had streaks of chocolate, and she was rolling out massive sheets of dough. But after my faux pas earlier regarding the state of Ellen’s marriage, I was attempting to act more “normal” when engaging in social discourse. Whatever that means. “What do you want, Gemma?” Jayne asked. Definitely busy. She didn’t usually snap at me. I try hard to stay out of her realm, which isn’t difficult. A kitchen, of any sort, is not my natural environment. “Gosh, Gemma. It’s so good, I’ve scarcely gotten any sleep for days.” The store had received an advance review copy some months ago from the publisher. I’d begun the first in the series but had never finished it. Too overwrought and overwritten for my taste. I thought it read more like a historical romance than a Holmes pastiche. To my surprise, the moment Jayne spotted the copy of Hudson House on my desk, she pounced. She declared herself to be a huge fan of the series. “They have a waiting list of one hundred and twenty-seven people?” I asked. “That’s not much notice,” Jocelyn said. Jayne pouted prettily. Jayne did everything prettily. She was tiny and blonde with sparkling blue eyes and a heart-shaped face. The Great Detective eyed me. I eyed him back. “Don’t give me any of your cheek, you.” I gave him a swipe across his exceedingly prominent nose with the feather duster. “He does give me the creeps, this one,” I said. “He always seems to be watching me. And not in an approving way.” The clay bust of Christopher Lee as Sherlock Holmes got another pass with the duster before I turned to greet the new arrival. The teapot and accessories were made of quality bone china and in excellent condition. Not so much as a crack or chip that I could see on a quick inspection. The decoration on the pot was of a hook-nosed man in a deerstalker hat peering through a magnifying glass, a pipe clenched firmly in his teeth. The accompanying cream pitcher and sugar bowl were adorned with smaller versions of the hat, pipe, and magnifying glass. “How much did it cost?” I ventured to ask. “Holmes never had a cream tea,” I said. “Cheerio!” she said, heading for the door connecting my shop to the tea room next door. I watched her go with a smile. The word that best describes my friend is petite. The second word would be pretty. She had shiny blond hair, bright blue eyes, a wide mouth containing perfect teeth, a pointed chin, and a heart-shaped face. She was short and fine-boned, and worked hard at keeping herself in good shape. She came up to my shoulder. I am not small, blond, or delicate, and I always felt like an awkward lump standing next to Jayne. I loved her dearly. Jayne also likes to pretend she’s English. I am English, but after more than five years in Massachusetts, even I don’t say things like Cheerio! anymore. Not that I ever did. I went back to my dusting. There’s always a lot of dusting in a shop like this one. I am the half-owner, manager, head shop clerk, and chief duster of the Sherlock Holmes Bookshop and Emporium in the Cape Cod town of West London, Massachusetts. As well as reprints of the original Sir Arthur Conan Doyle books, we carry new books representing anything and everything in the pastiche, or vaguely derived from the Holmes legend. From Laurie R. King’s Mary Russell (aka Mrs. Holmes) mystery series to the Curious Incident of the Dog in the Nighttime to Holmes for the Holidays, and all the myriad short story collections inspired by the canon. At the moment, I have a first edition of The Sign of the Four for sale, but it’s not worth much because of its condition. I suspect that at one time a mouse attempted to use some of the pages for her nest. I bought it for a pittance, carefully wrapped it in plastic wrap and stuck on a tag showing a minimal price as well as one explaining its condition. Someday, someone will buy it. I can still be surprised at what a dedicated follower of Sherlock will consider a treasure. Once in a while my uncle Arthur will locate original books in reasonable condition, as well as copies of the Strand Magazine in which many of the stories first appeared, but we don’t deal in rare and valuable editions. That’s not our business. Because not everyone (certainly not me!) wants to read about Holmes all the time, one wall of shelves is labeled “gaslight”, and features novels or anthologies, mysteries mostly, set in the late Victorian or early Edwardian period. Another shelf is for non-fiction, including biographies of writers of the age, anyone and everyone Sir Arthur Conan Doyle might have bumped into in his travels, as well as the histories of the times in which Sir Arthur lived. Books are my first (and I sometimes think, my only) love, and my intention when I came to America to take over Great Uncle Arthur’s business, was to continue to run this place as a bookstore featuring Conan Doyle, his contemporaries, and modern books influenced by them. But I quickly came to realize that these days, as everyone knows, Sherlock Holmes is far more than books, so we branched out into all forms of Sherlockania. I have tried to keep our stock dignified, but what I call “junk” and Jayne calls “memorabilia” began creeping onto the shelves as of Day One. The shop now sells movie posters, DVDs of the movies, collectables such as the aforementioned bust of Christopher Lee, and even mugs, towels, and dishcloths. First thing this morning, only a few minutes before I started dusting, I unloaded–I mean sold–a life-sized, stand-up, cut-out of Benedict Cumberbatch as Sherlock along with a full-color, illustrated book on the making of the contemporary BBC series. As well as the Bookshop and Emporium, Uncle Arthur and I are half-owners of the business next door. Jayne owns the other half and runs the place. We call it Mrs. Hudson’s Tea Room. The bell over the door tinkled and I glanced toward it. Then I glanced again. The man standing there was definitely worth a second look. He was tall and lean, with deep brown eyes, a strong jaw showing a hint of stubble, chiseled cheekbones, and a mass of brown hair curling around his ears in the damp sea air. He wore Italian loafers, khaki Dockers, and a blue-checked shirt with the top two buttons undone. His clothes were clean, but not new and the trousers could have done with the touch of an iron. He gave me a smile that practically lit up the room. The creature to which he was referring was Moriarty, the shop cat. Moriarty had roused himself from his morning nap and was happily rubbing himself against the man’s legs. “You have a good ear.” Most Americans can’t distinguish an accent from one part of England from another. Never mind Scottish from Irish or Welsh from English. He laughed. That is, the man laughed, not the cat. “Let me know if I can help you with anything.” I returned to my dusting. The man spent a couple of minutes idly looking at the Holmes and Watson chamber pot (which I suggest using as a planter), leafing through the movie posters, and examining the DVD collection. It was obvious by the way he barely looked at the objects he was pretending to be interested in that tasteless chamber pots and movie memorabilia were not the reason for his visit. His eyes wandered constantly to the bookshelves. The Holmes shelves, not the gaslight or non-fiction. Eventually he oh-so-casually drifted over. “Is that so,” he said, moving on to the bound collections of the Strand Magazine. “I do a mail order business, too.” I said. I wasn’t digging to find out where he lived. Really, I wasn’t. I didn’t know anything about him other than he was a native New Englander, had enjoyed a comfortable childhood, was educated at an Ivy League College, had spent several years in the UK, probably around Oxford (as either a post-graduate student or junior professor) and he was not here as a casual tourist. He was not wealthy, but not struggling either. And unlikely to be married. “I’ve recently moved to West London,” he said. “Welcome,” I said. It was a mild spring day, and earlier a strong breeze had been blowing in from the ocean. But the temperature in the shop was climbing rapidly. He smiled. I felt myself smiling back. I momentarily forgot myself and extended my hand to stroke Moriarty. In return the cat hissed and scratched my left arm. It hurt. Uncle Arthur had found the starving, abandoned kitten in the alley behind the shop two years ago, and lured him in with a dish of cream and sweet words. Moriarty’s lived here ever since. He’s a great shop cat. Everyone loves him and he loves everyone in return. Everyone except me. I try not to take it personally. Other animals seem to like me just fine. Maybe he misses Uncle Arthur and blames me for taking his place. Still, I keep trying to make nice. “I’m Grant, by the way. Grant Thompson.” He held out his hand. “Surely at Oxford you got accustomed to tea?” I said. Was I flirting? Why, I think I might have been. I waved my hand in the air. “You picked up a trace of an accent.” That, plus an educated guess on my part: he might have gone to Cambridge. Moriarty jumped off the counter. Tail high, he followed Grant to the door that led to the tea room. He was, of course, forbidden from going where food was served, and so he sat by the door gazing in wistfully. He was small in size, but gigantic in personality. I wiped a drop of blood off the cat-scratch on my arm. Then I flipped the card over. “Grant Thompson. Rare book collector.” No street address, just an email and phone number. A hiss caught my attention. Jayne, dressed in a long white apron over black T-shirt and denim capris, stood in the doorway. She pointed behind her to the restaurant, opened her eyes and mouth wide, and waved her hand as though it were on fire. Trust Jayne to notice every handsome man that came into her tea room. Business was brisk for most of the day. It was the beginning of the tourist season on Cape Cod and we’d placed ads in the visitors’ brochures. Many of the mugs and toys moved, mostly the cheap stuff that appealed to laughing groups of college kids or parents with small children. In season, I always keep a good stock of paperbacks for beach and pool reading and, as the forecast for tomorrow said it would rain, the DVDs sold well too. I kept half an eye on the tea room, and although Grant Thompson didn’t appear again, I was pleased to see a steady stream of customers coming in for lunch and later to enjoy afternoon tea. At twenty-two minutes to four every day I go to Mrs. Hudson’s for a much needed tea break. Today, as I was alone in the shop, I hung a “back in 15 minutes” sign on the front door. The phone underneath the sales counter began to ring, but I didn’t go back for it: voice mail would pick it up. The tea room closes at four, and by this time it’s normally almost empty. Jayne had done a great job decorating the place. The walls were papered in soft shades of sage green and peach, with white wainscoting. A portrait of Queen Elizabeth II was prominently hung on the back wall, amongst paintings of castles and thatched-roof cottages nestled in verdant pastoral landscapes. The wall adjoining the Emporium consisted of open shelves displaying rows upon rows of bone china tea cups and teapots, and a multitude of jars of loose teas and locally-made jams and preserves filled the space next to the swinging half-door leading into the kitchen area. I settled myself at my favorite table, a small one tucked into the window alcove. A bench seat was under the window, padded in soft fabric that matched the color of the walls, with two white-painted chairs opposite. A tiny white vase, containing a sprig of greenery and a single fresh flower sat in the middle of the table. Fiona, dressed in the tea room’s waitress uniform of knee-length black dress, black stockings, and white apron with the Mrs. Hudson’s Tea Room logo of a steaming tea cup next to a pipe, brought my drink in the new Sherlock Holmes pot. As someone who owns the Sherlock Holmes Bookshop and Emporium, you’d think I’d be a Sherlock fanatic. I am not. I leave that to Jayne and Great Uncle Arthur. I might not admire the decoration on the pot, but it was a proper china tea service and so would suffice. I let the tea steep for a few minutes, and then poured it carefully. The rich full scent of Darjeeling rose up to caress my nose. I breathed it in and then added a splash of milk to the golden liquid. Perhaps the hardest part of my entire job has been to teach Americans to make a proper cup of tea. I take great pride in the fact that I have succeeded, here at least. “Excellent.” She took a cucumber sandwich for herself. At twenty to four every day, we have our afternoon tea (consisting of whatever’s left over) and discuss the day’s business. “I see Fiona had another fight with her husband,” I said. What big group?” I asked. She rolled her eyes. Okay, so I’m not a very good waitress. I’m not much of a cook either, but I can slap a couple of pieces of bread together to make a sandwich. Provided, that is, Jayne tells me what to put in the middle. I popped the last piece of scone into my mouth. Then I stuck my finger in the small pot of clotted cream, scooped out the remains, and sucked cream off my finger while Jayne rolled her eyes again. “Business meeting over?” I asked. I tried not to let my disapproval show. Fortunately, Jayne was finishing the last of her tea and not looking at me. Jayne was my best friend as well as my business partner, but she had the world’s worst taste in men. Every time she found a new boyfriend, I figured it couldn’t get any worse. And every time it did. Not that her boyfriends were violent or of the criminal element. Nothing like that. But they seemed to have problems finding – and keeping — regular employment. In a thriving tourist town in season, that was a difficult thing to accomplish. Robbie was an artist, as Jayne’s boyfriends usually were. The sensitive, creative sort. The sort, Jayne always patiently explained to me, who couldn’t be lumbered with the tedious monotony of a regular job as they had to be ready to leap into the act of creating art whenever the muse happened to strike. I might have mentioned once that Picasso was said to have remarked that inspiration comes when you are working. Jayne reminded me that Picasso hadn’t always been famous.